Veteran MFGG members may remember something like this all the way back in 2011. That was my attempt to put a spin on Hello's SMB1 Engine except it was completely terrible because I just wasn't good at making games then. In fact, aside from Somari 2 - which was more-or-less cobbled together remains of a canceled project - I have not created a game for MFGG in nearly seven and a half years! So what's a better way for me to come back with a contribution than to turn something I've quickly neglected into a gaming homage that I can be proud of? I've analyzed plenty of criticism I got from the 2011 demo, restarted the project completely from scratch, studied Commander Keen's levels closely, and heavily poured all my effort into this for approximately five weeks using my game dev prowess that I've built over the years since my time away from MFGG. The game even features an original soundtrack composed by my good friend, Alexander Lyons. All in all, I hope you enjoy what I've cooked up! I played this to see how you've improved, since your other games from years ago are... uh, not so great. I played a few levels and I have to say that's it's very much an improvement. I'll have to make a review when I finish it. I got through 8 levels so far (9 if you count the BwB Megarocket) and I'm having fun so far! 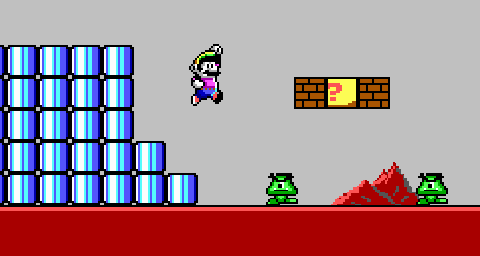 I noticed that some obstacles don't act exactly like how they do in Commander Keen (the Butler Robots, for example, push you in Keen, while they kill you in here), which kinda threw me off a few times. Once you get past that, though, it's not so bad! It's okay. You can say they were trash, lol. I tried too hard to think I was pushing out content significantly, and I simply didn't have the knowhow I currently do to, for the least, make something enjoyable. I am not even really a fan of my old reviews; looking back, I made my rhetoric sound too much like a cynical whiner. I would definitely be interested in seeing that review. Admittedly, I changed their behavior somewhat because I wasn't quite sure how to program bouncing from the side. Meanwhile, there already was code for Mario bouncing off something by jumping on it, so you could still do that with the robots. I felt like it at least made sense on account of being Mr. Stompy himself. 1) Any teddy bears you collect are only counted towards the total collected when you beat the level they're in. Talking to the pink adult Toad triggers the Teddy counter. 2) Big aliens still cannot be touched by the player. 3) There are ending tiers depending on how much you've cleared on the game. There is no "bad ending" per se, but meeting certain criteria can add a cutscene or two. I haven't even played them. The screenshots kept me from having interest lol. Your reviews back then always stood out to me (in a bad way) and left me with a bad impression of you to be honest. They always sounded way too harsh and not very constructive. I'm not sure if you review stuff now, but it'd be interesting to see one if you do. I did see those couple comments. I just didn't say anything because it was rather justified and I had no means of showing I've changed my style here. I've actually served as a reviewer for The Inner Circle Games Network these past few years until this January. They're not as well known as mainstream publications, but I've gotten to cover plenty of 3DS, Switch, and PC games. There even have been some developers that responded positively to my feedback, so I must have been doin' something right!